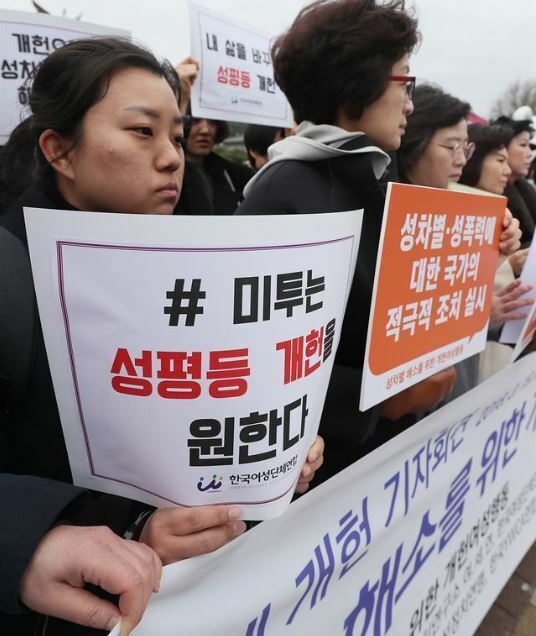 Korea ranked 115th out of 149 countries in the World Economic Forum’s report on the global gender gap released Tuesday. According to the 2018 report, Korea’s gender gap index was 0.657, below China (0.673) and Japan (0.662). The closer the figure is to 1, the greater the gender parity. Korea ranked 118th in last year’s report, with a gender gap index of 0.650. Korea scored lowly in terms of gender equality in economic participation and opportunity, ranking 124th with an index of 0.549. It ranked 92nd in gender equality in political empowerment, with 0.134. In economic participation and opportunity, the income parity index stood at 0.532, lower than the global average of 0.632. The level of estimated earned income, by purchasing power, was $52,590 for men and $24,054 for women. In political empowerment, Korea came in 102nd in the ratio of female legislators, and 119th in the ratio of female Cabinet members. In terms of the period of top female leadership, Korea ranked 28th, the same as last year. Korea topped the lists in primary and secondary educational opportunities, but took a step down to 113rd in tertiary educational parity after high school graduation. In terms of health, Korea ranked No. 1, like last year, in the life expectancy category. As for gender imbalance in terms of births, Korea ranked 137th, worse than last year’s 132nd. At the current rate of progress, the global gender gap will take 108 years to close, and the workplace gender gap 202 years, WEF said. WEF also expressed concern that as automated machinery replace jobs traditionally considered as those for women, relatively less women compared with men were working. In the area of artificial intelligence, women’s participation rate was as low as 22 percent. Iceland had the smallest gender gap (0.858), followed by Norway (0.835) and Sweden (0.822). Among Asian countries, only the Philippines (0.799) made it into the top 10.